Miller is one of our finest suppliers of bathroom interiors, who, like us, are a family run business. For five generations, the Miller family business has created high quality fittings and accessories, and turned their hand to bathroom furniture and accessories in 1975. Miller prides themselves on creative design, development and high quality manufacturing, aiming to create timeless pieces with a superior finish. It’s a strong belief at Miller that given the amount of time you and your family spend in the bathroom, you deserve something special to make your bathroom beautiful. Coming from a family business ourselves we can’t help but relate to their efforts of tradition, quality and authenticity; like us, they aim to make shopping with them an enjoyable experience for the whole family and that is why we are proud to be a stockist. As you can imagine, with five generations comes a lot of history. 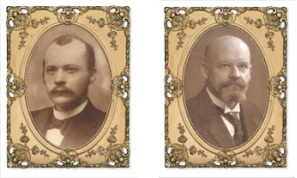 It all began with the Miller brothers, Justus and Fritz, or perhaps their Father; in actual fact it was at their father’s weapons workshop, in Printzeryd, in southern Sweden, where the brothers began casting furniture fittings for the first time. In 1903, the business began to grow out of their Father’s workshop and so was uprooted to a shiny new, modern factory, where the business is still located to this day. The two brothers kept the business thriving until the son Einar, took the reins in 1936, then in the 1960’s Einar’s son, Birger, took over from him. Birger looked into other avenues and began manufacturing car parts for SAAB and Volvo, Miller created thermos flasks and most interestingly a gold plated cobra telephone commissioned by the Shah of Iran! Birgers son, Christer, joined the company in the early 1980’s, Christer noted a shortage of attractive bathroom interiors in the UK market and decided to make a plan of action. After ceasing manufacturing furniture fittings and turning their attention to the wholesale trade, bathrooms became a priority. Christer took off to England to pursue the dream of becoming a market leader in attractive bathroom interiors with the aim of giving a little TLC to the neglected bathrooms hidden away in England’s homes. Miller’s own design bathroom collections swiftly gained momentum in England and became very popular, and in 1987 Christer returned home to Sweden in order to take over the company. Nowadays, the company’s activities are divided between hardware fittings and bathroom interiors. 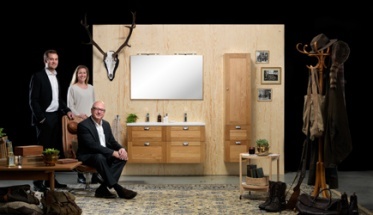 For a number of years now, Millers bathroom furniture has been available on the Swedish market and here – all carefully assembled by hand in the companies very own facility where it all began in 1903, in Bankeryd. Today, it is the Miller’s fifth generation, Frank and Maria, who are running the business together with their father, Christer. Miller has a genuine passion for beautiful, quality craftsmanship and are proud to give their furniture the family’s seal of approval. We know that Miller represents both tradition and authenticity alike – something you can rely on. They hope to create genuine moments of tranquillity which improve your quality of life and to deliver you the bathroom of your dreams. A good morning – and an equally good night. This is the ideal they try to live up to each and every day – and they call it the Miller Way. Miller bathroom accessories come in many different ranges to suit you, but as you’d expect for Swedish design, are all sleek, simple and elegant. We stock many more Miller Bathroom Ranges, but hopefully the little taster has you in agreement that the stylish Swedish brand has a good thing going! We also have a range of mirrors, lovely light pulls, beautiful bathroom baskets and fantastic free standing and wall mounted accessories, all from Miller; reaching superb standards and beautifully high craftsmanship. Bathroom Accessories, Bathrooms, Miller, miller Bathroom Accessories, Miller Bathroom Interiors, Miller History. Bookmark.